VLTAVAN GUILD IN PRAGUE 140 years have already passed since the Guild Vltavan was founded in a Prague part Podskalí on June 11th 1871. This society brought together people of various professions hardworking on and around the river Vltava. Floating of timber and other goods was carried out on the Vltava from time immemorial. In 1088 the first Czech king Vratislav I is said to establish a toll called „výtoň“ (literally „the cut“) on floated timber. From rafts arriving in Prague Podskalí at the mouth of Botič stream a certain number of beams were cut off. The revenues collected there benefited the church, royal rulers, the town. Both place and then the building of the custom house, were also called „Výtoň“ and became themain center of timber trade in Prague for many centuries. In order to maintain wood trading monopoly, a timber floaters‘ guild was founded as early as in the second half of the 15th century. Its most important members were owners of houses with waterfront properties. The Guild had ruled and organized all economical activities in Podskalí through its „Office of River Rights“ till 1783. At that time timber floating and trade were by the patent of the Emperor Josef II declared free and the Guild was dissolved. Wood trading and floating continued successfully, hard and risky work of rivermen remained. The need to establish some kind of community to provide mutual assistance and protection arisen. That is why „the people of the river“ took the opportunity of a new law that allowed founding of workers´ and co-operativ clubs and associations. 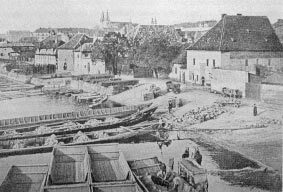 The preparatory commitee for the establishment of Vltavan Guild consisted of timber traders and representatives of various professions related to the river, editor of the „Worker“ magazine Václav Petr and reputedly one of the most respectable citizens of Prague of that time, the major František Dittrich. At the founding session, the representatives of the noble families Schwarzenberg and Lobkowitz were also present. Leopold Heyduk was elected as a first chairman of the Guild. Contemporary revolutionary atmosphere of 1871 was obviously reflected in festive costumes used since those days. It’s heritage of the French merchant fleet sailors. In the following years fraternal Vltavan guilds were founded – in Davle (1897), Štěchovice (1898) and Purkarec near Hluboká upon Vltava in South Bohemia (1902). The main purpose and activities of the Guild were mutual assistance and charity. It participated, however, in many nationwide patriotic and cultural events since the very beginning of its existence. 02The Guild resides in the building of a former Customs House „Na Výtoni“, where a museum exposition of old Podskalí, raft and ship transport on the Vltava is situated. The Gild contributed to the museum collections a great deal as gathering and preservation of memmories of the life in old Podskalí was always the part of its activities. After 1960 when construction of Vltava river dams was completed, the rafting trade ceased to exist. The Guild focused on its heritage and homeland cultural studies. In 1990, the Guild gained its former legal independence, its code of rules was approved. Thanks to members‘ devotion, patriotism and respect to long-lasting traditions, Vltavan exists to these days and is considered to be the oldest professional guild both in Prague and the Czech Republic. Guild members strive to enrich cultural and social life in Prague. The main event is the Annual Ceremonial Ball. Another event that receives press and television coveridge is the annual „Commemoration Ceremony for the drowned in Bohemian rivers“ when a funeral boat arrives at the statue of „Vltava river and its tributaries“ near the Bridge of Legions on October Sunday before the All Souls Day. 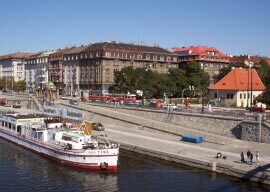 A new traditiom is meeting at Podskalí on the occasion of the Guild‘ foundation anniversary in mid-June that includes very popular cruises on a paddle steamer. An important part of Guild’ activities is co-operation with and support of the association of handicapped youth and children „Handicap Lyceum Praha“, co-operation with the local school Botičská and its „Centre of free time activities“ as well as with the local branch of the Municipal Library of Prague. Very successful co-operation has been established with the City of Prague Muzeum, with Prague 2 City District Administration, with the church – Vyšehrad Chapter. 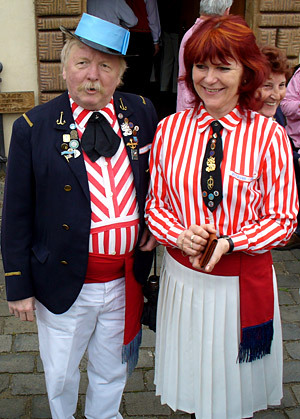 The reputation of the Guild can be documented by the fact that Prague mayors accept honorary membership of the Guild. All four Vltavan guilds formed „Vltavan Čechy – Vltavan Bohemia“ which is a member of the „International Timber-Raftsmen Association“ and represents the guilds abroad. Among the most remarkable events of the fraternal guilds is a tour to Vltava springs near Kvilda in Šumava Mts. where a memorial plaque dedicated to „Vltava – the breadwinner“ was instaled in 1970. In January 2005, the Guild annual meeting elected brother Jaroslav Červený as the chairman of Prague Vltavan’s board of management. At present, more than hundered persons make the member base of the Guild.